Happy New Year all! I hope the last month treated you all well, and that you had a wonderful Christmas and New Year's Eve! I took a little break the last couple of weeks from posting on social media and blogging, and it was kind of nice to take a step back. I took some time to evaluate my business and the past year in general, and to focus on some goals and ideas for 2018. Last year I chose a word of the year instead of the same old typical resolutions (lose weight, work out more, eat healthier) and I really liked it. I chose the word 'moderation' and I felt like I was able to focus on it and keep applying it all year long, instead of slowly fizzling out a few months in like I usually did. I think that picking one specific idea instead of several more general goals worked well for me. I ended up focusing more on moderation in my eating than anything else, and I started having some health issues in the spring that really made me have to be more strict with my food. The result was that I lost 17 pounds over the last year (and only gained one during the holidays!) and I've been able to have goodies around and not just completely binge like I would have in the past. It's helped me create more healthy habits and I consider it a success for the year. This year I decided to continue that practice and as you probably guessed from the photo above, I chose the word 'productive.' I have always been a procrastinator. I even wrote a funny post about it several years ago when I first started blogging! I tend to put things off if (especially if it's not urgent), and I've always said that it's because I work better under pressure. But the older I get, the more it just stresses me out, and it's time to change. 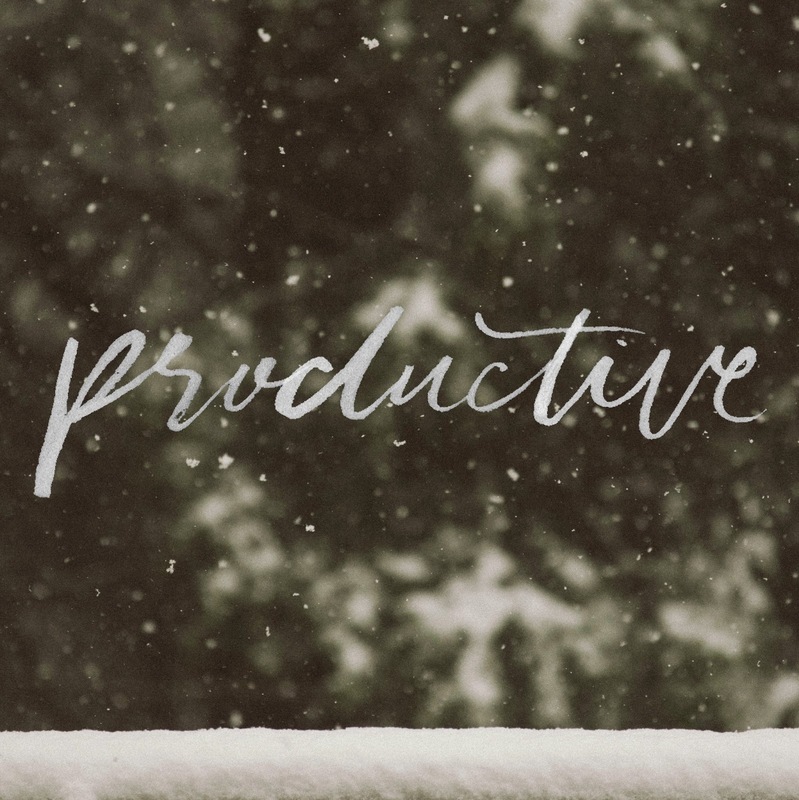 With the house getting closer to being finished (which means more hands on projects for me), and other goals I have for my business and blog, I know that being more productive is key. So my plan is to create a solid routine for my day to day, and stick to it! I've done that in the past, and I do so much better on a good schedule. I've been reading up on some articles on how to be a more productive person (I pinned them all to my New Year board), and I've found some good ones that I think will help me in the areas I need to work on. First and foremost is setting a strict bed- and waking time. I struggle so much with keeping a good sleep schedule! It's so easy for me to stay up late and sleep in most days, but the last month I was fighting off a bug and it was worse than usual. No matter how hard I've been trying I just could not get it turned around! But I've been working on it and this week I'm knuckling down and making it happen. 6:30 a.m. is going to be my new best friend! I also intend on using more time blocks for daily tasks that I do every day. This way I don't get sucked in and distracted on social media, or putter around and bounce from one little task to another when I know all I really need to do is the dishes. This will help me get through my day to day while still allowing me to have time to focus on bigger projects like the house. So that's my word of the day. I hope this year will be successful and kind to us all! And I'd love to know, do you set resolutions for the year, or choose a word? Or do you just think it's all nonsense? Haha! Let me know! Happy 2018 everybody, and thanks for stopping by!